A big thank you for the GASP people for inviting us and presenting us their project! What an interesting and great thing for those young lads to be involved in! We will try and give them as much publicity as possible. If you hear of anyone who needs to get rid of a car, GASP may be interested or if you know of any engineering companies that may wish to take on one of the lads for work experience or an apprenticeship do tell them about GASP. Also, if you know of any young people struggling at school, do let them know about GASP. 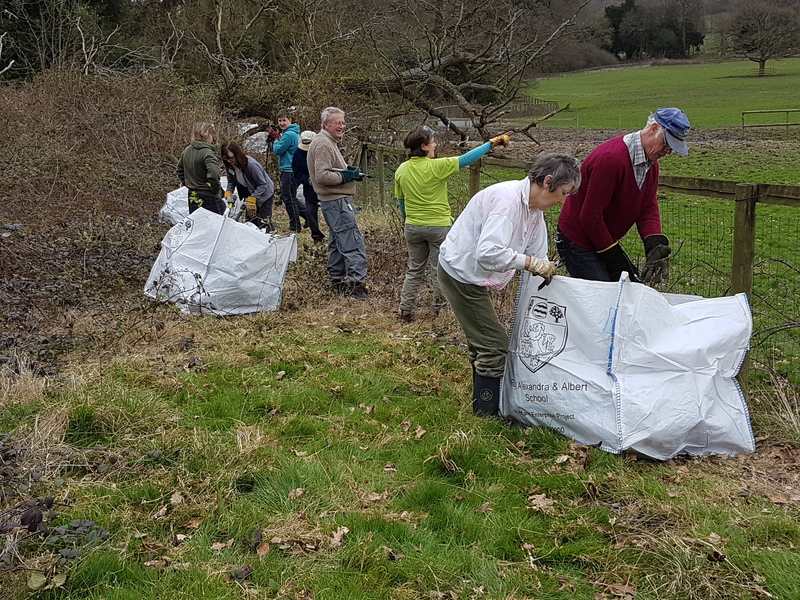 We had a really enjoyable day out assisting Chief Executive, Louise Miller with a day’s scrub bashing in the beautiful grounds of Gatton Park. The sweeping landscape, including a hand dug lake which was the work of famous landscape architect, Capability Brown. The Surrey Hills Society have been supporting the Gatton Trust with their Heritage Lottery Funded Project during the last 18 months, to restore some of the original features of the park, as part of the 300th anniversary celebrations for the celebrity garden designer of his day. It was great to meet some of the people who regularly volunteer for the Trust. It was also interesting to be able to view the new landscaping around the lake that the SHS had raised match-funding for. As a treat, in the late afternoon, we were taken over to view the special Japanese garden which was once featured on “Gardener’s World”. I will definitely be volunteering there again. Torrential rain cleared for our “Inspiring Views Walk” in The Hurtwood and Winterfold Hill, names as poetic and imaginative as the poetry and music that have been created to accompany and enhance the experience of the quirky seat sculptures on The Greensand Way, funded by The Mittal Foundation. As someone who knows and appreciates this Area of Outstanding Natural Beauty and the viewpoints where the seats are located, I have to say that for me nothing more than that which nature has already provided is necessary, but thanks anyway for somewhere to sit! I am all for keeping sculptors, poets and musicians in work and this has been achieved, I would add at the additional cost of a booklet (how many trees were felled for this) explaining what was going through their minds. The walk was delightful and the gods were on our side as the heavens once again opened as we came to the end of our trail. 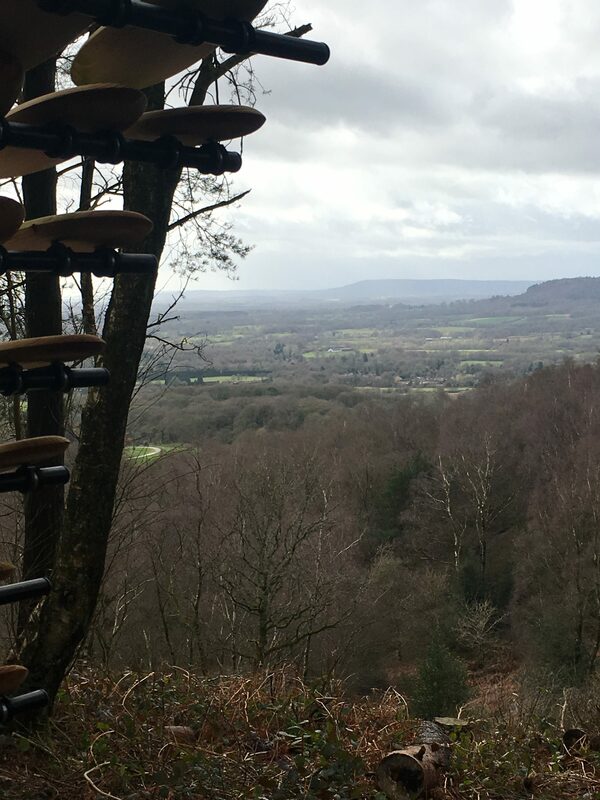 The Surrey Hills Society brilliantly provides great opportunities to see, experience and learn more about the diverse aspects of this most sylvan beautiful county.